Fossil specialists tell us that waves of extinction, hundreds of them, interrupted the story of life on Earth during the last billion years. Only five of these are what paleontologists have considered mass extinctionsextreme episodes that covered the whole world and killed off at least half of all known animal species. 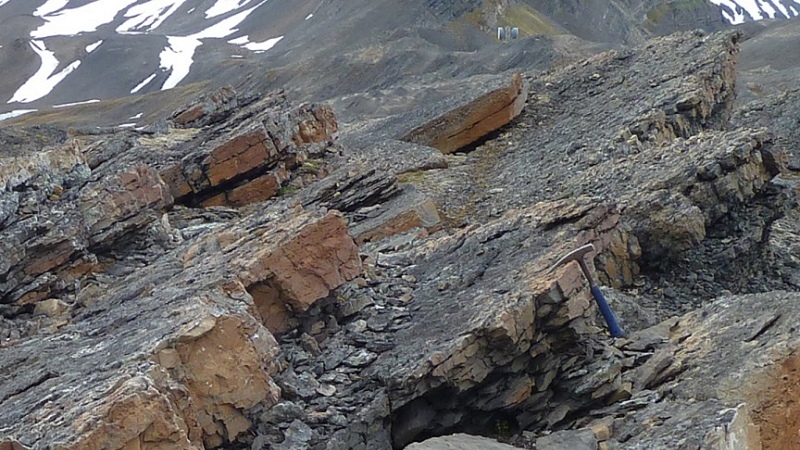 A new study of rocks in the frozen land of Spitsbergen, a Norwegian island in the Arctic Ocean, points to a sixth mass extinction. It happened about 262 million years ago during the Capitanian Age of the Permian Period. The Earth looked very different in those days. Most of the dry land was in the supercontinent Pangea. Geologists already knew there had been an extinction event during the Capitanian Age, but didn't know how widespread it had been. Researchers first documented it about 20 years ago, in rocks of southern China that formed in a tropical ocean. There, it was clearly an awful catastrophe. For instance, it killed seven-eighths of all species of brachiopod, a family of shellfish that once dominated the seafloor. But was it a truly global, mass extinction, or a regional one, restricted to the tropics? A team of researchers, led by David Bond of the University of Hull, took up this question by looking for extinction evidence elsewhere. They knew limestone of Capitanian age exists in Spitsbergen, a glacier-swept set of Arctic islands administered by Norway. During Capitanian time, this area was a cold-water coastal sea around the latitude of Maine, part of the Boreal Ocean. Bond's group combed the Spitsbergen limestones for fossils of brachiopods and bivalves (the shellfish family that includes clams and oysters), while also taking hundreds of rock samples for lab tests. They published their results in the Geological Society of America Bulletin this week. The researchers were lucky that the extinction coincided with a widespread set of three distinctive beds of orange limestone. Recognizing this triplet in several different spots helped them compile a high-quality record showing a major, geologically sudden extinction in the fossils. At one point they counted 32 different brachiopod species. Just 30 centimeters higher in the rock outcrops, they found only four. It took more work to correlate this evidence with the Chinese record, because the Spitsbergen limestones have none of the volcanic minerals that were used in China to determine an exact age. Nor do they have any of the conodont fossils that were used to assign a fossil age to the Chinese rocks. However, the lab tests on the rock samples established an intricate "fingerprint" of environmental changes during Capitanian time in Spitsbergen based on: carbon isotopes (indicating atmospheric conditions), strontium isotopes (a sign of continental influence on seawater), magnetic tests (recording reversals of the Earth's magnetic field) and trace metals and pyrite crystals (representing ocean chemistry). Much of this evidence did match the record from China. And Bond's group found similar patterns in rocks from Greenland and Arctic Canada, some of which contained conodonts matching those in tropical China. The connection isn't straightforward, but it's strong enough to earn publication. Combining their new results with earlier data about the Capitanian extinction, Bond's group argues that the cause may have been ocean acidification, resulting from massive volcanic eruptions near China. They conclude that "the Capitanian crisis did not, as previously thought, simply affect tropical marine biota: It was a truly global mass extinction." The "Big 5" mass extinction events are the end-Ordovician, late Devonian (Frasnian-Famennian), end-Permian, end-Triassic and end-Cretaceous (or "K-T"). They are so profound that even before we recognized their scope, they defined the ends of their respective geologic time periods. Many people argue that today, human influences are causing a Sixth Mass Extinction. But if there've been six already, we need to change that numberor stop the total so it never goes beyond six.